Jack Madgen will join Collingwood as a Category B rookie in 2018. Image: Collingwood Media. 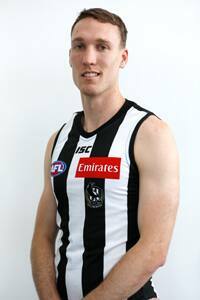 Collingwood’s 2018 list is now complete, with the signing of Category B rookie and former basketballer Jack Madgen. At 24 years old and standing at 192cm, Madgen is slated to play as a defender who can match up on tall or medium-sized forwards. In his previous life, he was a four-year shooting guard with US college Delta State University. The Magpies’ recruiting team hope the professional standards he has set in his basketball career can help him quickly adapt to life as an AFL footballer. “In addition to impressive defensive capabilities, Jack has a huge work ethic and a real willingness to learn the game,” National Recruiting Manager Derek Hine told Collingwood Media. Born and raised in South Australia, Madgen is not completely foreign to football. He played in the Barossa Valley League until the age of 18 before switching his focus fully to basketball. While the decision would have been a tough one, you can hardly blame him. A life in hoops runs in the family with brother Ben the former captain of the Sydney Kings in the NBL, and sister Tess having also represented Australia on the hardwood. “My brother had done the college scene and my sister was at the AIS for basketball when I had to make the choice,” he said on Tuesday. Madgen went from the heart of the Bible belt in the US to Far North Queensland upon return to Australia. He experienced a taste of professional basketball as a development player with the NBL's Cairns Taipans in 2016/17, even managing court time before his stint with the team concluded. In switching codes, he hopes to bring more than just a fresh face and interesting backstory to the Holden Centre. “I’ll bring an ability to read the play and react quickly to in-close circumstances. I hope I can bring some athleticism from my basketball background as well. Madgen on court during his time in the US with Delta State University.